Trying to find information about a particular Vietnam fatality is a hit or miss operation. You have to start with the basic facts about the incident you are trying to find. For example, you could know this about Merle Higgins: arrived in Vietnam on January 5, 1969; assigned to the 25th Infantry Division’s 4th Battalion, 9th Infantry (the “Manchus”); died of multiple fragmentation wounds received on June 5, 1969. Then you search the Internet for his name, the unit, the date, the location, and anything else you can think of. After coming up dry, you are about to give up when you hit on a document called “Our Manchu Diary.” Forty-four pages long, it contains day-to-day troop movements, field operations, battles, casualties, and remembrances of from 1966 through 1970. Sgt. Higgins was born in Farmdale, OH. 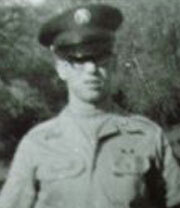 At the end of Merle’s 5th grade year, the family relocated to Jamestown, PA. After graduating from Pymatuning Joint High School in 1965, he attended Thiel College before entering the army in February 1969. He was survived by his parents, Ellis R. and Ruth Anderson Higgins, and two sisters, Marian and Nelly. In the spring of 1992, his family established the “Merle R. Higgins Freedom Award” fund at Jamestown High School, not only to honor Merle, but also to remind people that freedom is not a cheap commodity. lt is a fragile ideal that only exists because of the suffering and sacrifice of brave men and women. This award is given annually to two deserving seniors (one male/one female) based on the character qualities of courage, honor, loyalty, determination and service. Sgt. 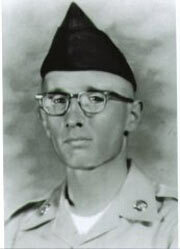 Higgins was the first Jamestown soldier to die in Vietnam within a two-month period. Their company got back to the base once a month or so for three or four days to relax, blow off steam, take hot showers and eat warm meals. The rest of the time they spent out in the bush. That’s where things were really rough. Once Rodger was pinned down for a whole night in one of those rice paddies bubbling with machine gun. While he was a radio operator, he had to carry not only the heavy radio, but also his rifle, 300 rounds of ammunition, and his chow. On one mission he walked 18 miles in three days carrying all that stuff. After a week or so fighting on Batangan Peninsula, he started going to church and wore a cross around his neck. He probably got a morale boost at the end of May when his home-town friend, Charlie Reefer, was assigned to his company. Rodger treasured the “care packages” he got from home. In one letter he thanked his mom for the cookies she had sent, and told her that it had rained hard right after they arrived. He says he ate them with a spoon. Rather than having cookies and cream, he had cookies and water. His letters were filled with thoughts and dreams about what he would do when he came home. Before he went to Vietnam, he owned a Harley 350 motorcycle. His dream was to buy a bigger bike when he got back. Unfortunately, that dream was to remain a dream forever. He was killed on July 16, 1969, the second of three men from the small community of Jamestown, PA, to die in Vietnam within a two-month period.